Men's 1960s mod herringbone windowpane check blazer jacket in charcoal. The retro herringbone windowpane check wool fabric takes in dark grey hues punctuated by striking flashes of red and works brilliantly with the geo floral pattern lining. The left side breast pocket features the same Geo floral design and can be utilised as a stylish pocket square effect when desired. The suit blazer benefits from stylish 2 button single breasted fastening, retro notch lapel, side vents and 3 button non-working cuffs. The blazer exudes a country heritage flair with hints of Peaky Blinders, 1930's styling for a dashing and debonair gangster look. The detachable metallic feather lapel pin further enhances the jackets vintage appeal. Team this mod 2 button herringbone windowpane check blazer jacket with the matching V- neckline waistcoat to create a sublime tailored mod ensemble. Mod herringbone windowpane check 2 button blazer jacket in charcoal. 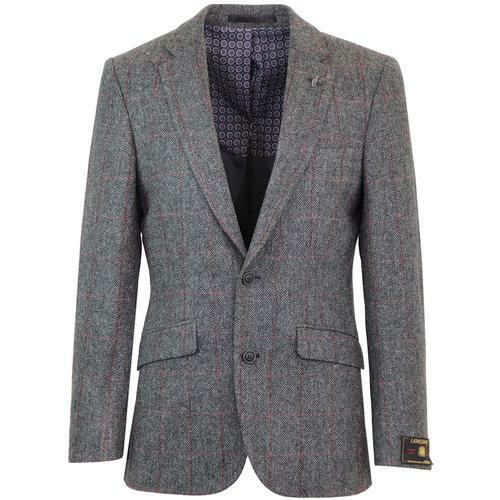 Wool herringbone fabric with red windowpane check pattern. Left side breast pocket with internal colour contrast pocket square bag. Detatchable metallic feather lapel pin. SKU: S18520JC Herringbone Windowpane Check Jacket. Composition: 100% wool. Lining 1: 100% polyester. Lining 2: 100% viscose. 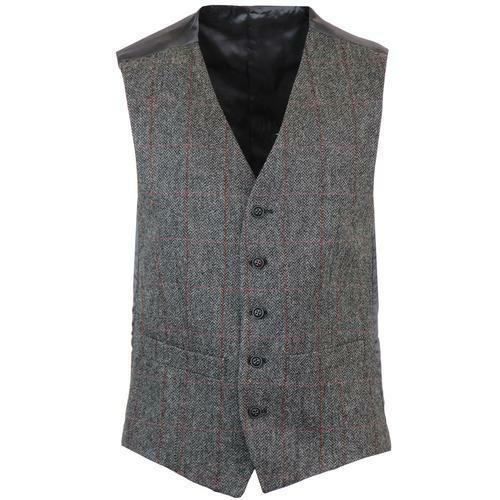 Men's mod V-neck 4 button waistcoat in a stylish grey herringbone windowpane check fabric. 2 side pockets and classic V-neck collar for that classic tailored mod look. 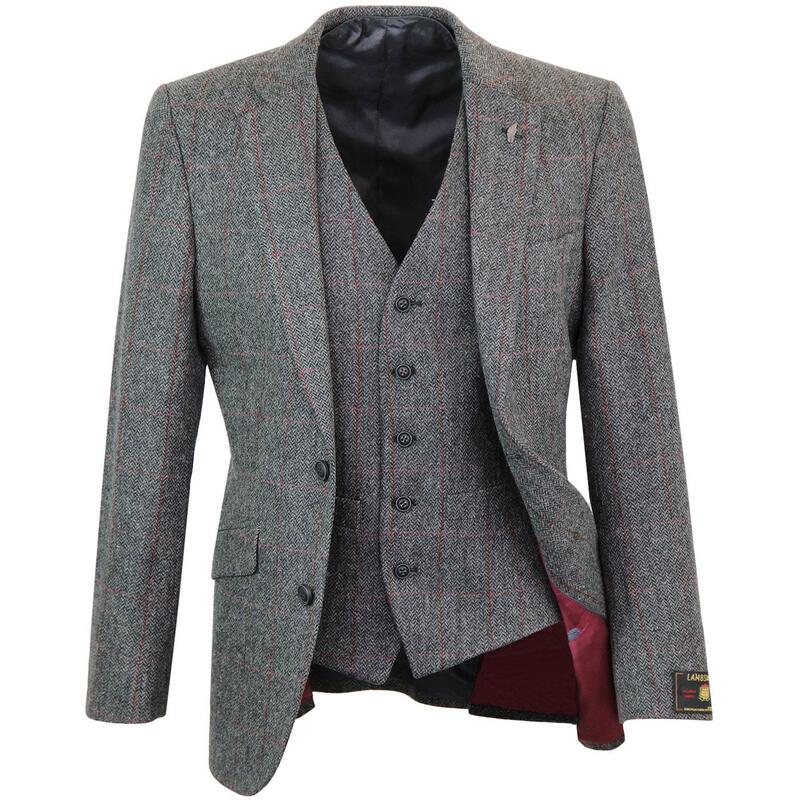 This smart dress herringbone check waistcoat features a grey sateen back panel with retro tab adjuster. Traditional waistcoat shaped hem. Steeped in vintage 1930s style with a hint of country heritage styling. Team this herringbone windowpane check mod waistcoat with the matching 2 button blazer to create a stylish tailored ensemble. Men's retro V-neck waistcoat in charcoal. Herringbone fabric with contrast red windowpane check pattern. SKU: S18520W Herringbone Windowpane Check Waistcoat. Composition: 50% wool, 30% polyester, 20% cotton. Lining 1: 100% viscose. Lining 2: 100% polyester.